With so many great Premium WordPress Themes to choose from it’s sometimes difficult to find the one you’re really looking for. Each theme is comprised of different design elements, functionality and features, so how do you find the one that’s right for your particular website project? I’ve come across quite a few Premium WordPress Themes and below you’ll find some of the best ones I’ve seen. I hope it helps you on your search. Most of the Premium WordPress Themes below only cost around $35 each which sounds like a pretty good investment to me. These themes are especially good because you can customize them to suit your specific needs and best of all you don’t need to know how to write any code. You can customize things like colour schemes, layouts, background images, fonts, logos, social media widgets and much more. Some very creative web designers have put a lot of time and effort into designing and building these pixel perfect website themes and it really shows when you look at them. 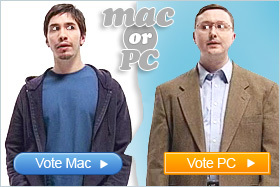 Simply click on a theme below to buy it or find out more about it. Best of luck finding your premium theme! 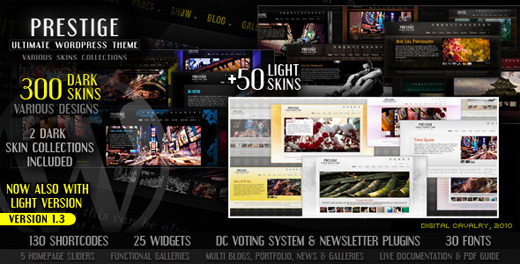 This theme is best suited for portfolio and business websites. A fantastic 3D image slider sits center stage on the homepage and can be easily controlled from the backend. There are 3 great skins to allow you to change the look and feel of the website with ease and the huge backend allows you to customise much of your site without needing to know any coding. This is a modern high impact theme which comes in a range of great colours. 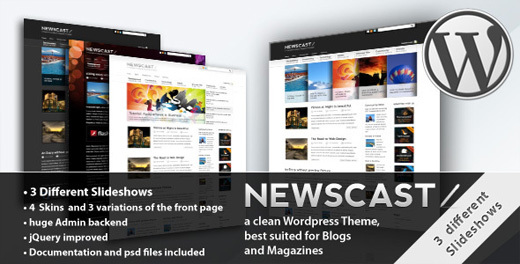 It’s suitable for blogs, news sites, portfolio sites and even business sites looking to show off their creative flair. It come with quite a few special features including: automatic jQuery image slider, lightbox image plugin, validating contact form as well as a highly customizable backend that allows you to manage your theme via a simple interface. This means you spend more time writing articles and less time getting your theme setup. This clean and flexible theme features large article images along with nice typography making it a great theme for graphically rich blogs and news sites. It comes with heaps of great templates, layouts, features and custom widgets to really help you customize your site so that it stands out from the rest. A solid theme with some great features. Best suited for magazines and blogs this theme comes with 4 great looking skins along with 3 different image and news slide shows, jQuery drop down menu and multiple page layouts. 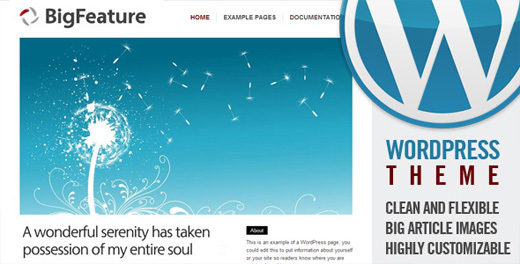 It has a clean and simple design making it great for use in almost any web magazine or blog. 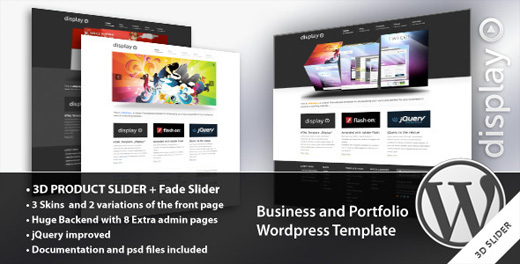 This stylish theme is best suited for business and portfolio websites. It comes with 5 different skins, a sleek jQuery image slider, drop down menu, gallery page with lightbox along with a bunch of useful backend functions. 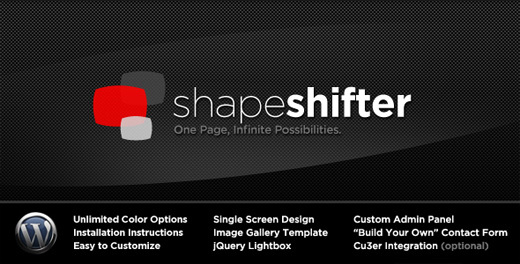 A solid theme for any business or portfolio website. This is a very simple and stylish single page WordPress theme which is especially good for creative business websites and design agencies. Built using a template that slides vertically from one section to the next this single page theme works really well with simple sites that don’t have much content. It’s also very easy to customize and comes with jQuery lightbox, CU3ER 3D image slider, “Build your own” contact form and unlimited colour scheme options. A simple yet very powerful theme. 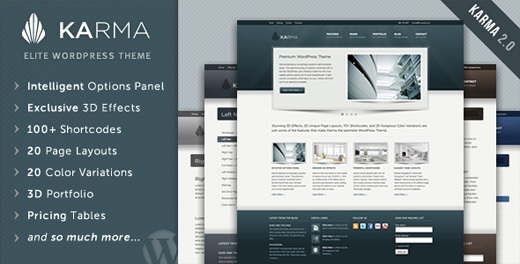 Karma is a stylish modern theme that features the famous CU3ER 3D image slider on its homepage. It’s built on a highly intelligent framework and includes 20 different page layouts, 20 colour scheme variants, over 100 shortcodes, 3D portfolio, custom pricing tables along with some impressive 3D image transitions. 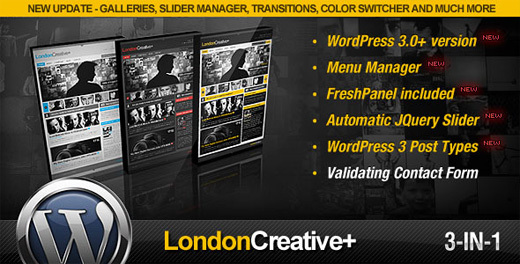 A highly customizable theme suited to corporate websites, blogs, magazines and even portfolios. 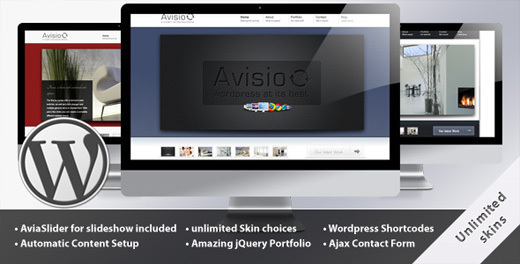 Avisio is a modern theme with a stylish look and feel that’s best suited for business and portfolio websites. This theme is highly customizable and allows you to change the look and feel of your site with a few simple mouse clicks, no coding required. A large image slider fills the homepage and the portfolio page is put together cleverly using some nice jQuery effects. 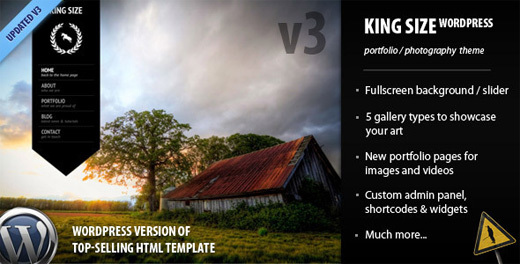 King Size is a very unique theme which features full screen background images which create a very rich looking website. This theme is suitable for many type of websites but is mainly focused towards photographers who want a nice way of showing their portfolio of photos. This theme is highly customizable with 5 different gallery styles and 3 light-box variations. It also allows you to blog about your photos too which is a nice bonus. Striking is a Powerful Premium WordPress theme that can be used for blogs, portfolio websites and business websites. It’s easy to customize via the admin panel, and it provides full control over all major design elements throughout your website, including colour and fonts. 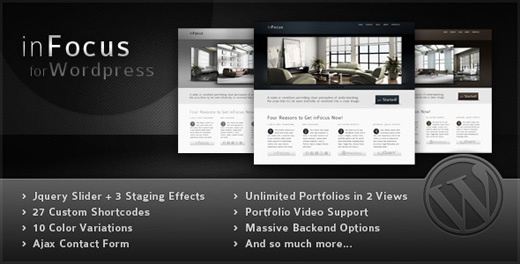 This theme comes with an impressive fully customizable jQuery homepage slider with 3 different staging effects. The custom back-end area gives you complete control over the look and style of your theme and best of all there’s 10 theme variations to choose from. Prestige is a unique and advanced WordPress theme that comes with a pack of different skins, short-codes, widgets and fonts that are all easily changed via the admin panel.